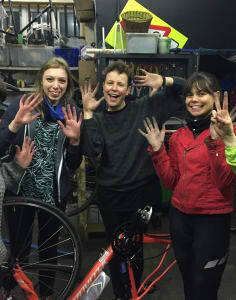 The London Bike Kitchen is an open DIY workshop where you can learn about your own bike instead of giving it to someone else. Consider us a Do-It-Together education space. Whether you're a total bike n00b or an experienced tinkerer, we've got classes to build your skills. We run daily classes ranging from Introduction to Maintenance and Gear Indexing, all the way to Build Your Own Bike and Wheel Building. We also run drop in sessions Tuesday - Sunday and work on whatever you like. We don't take bookings, it's first come first served. There is always a mechanic on hand to answer your questions. We sell most things you'd find in a regular bike shop, and if you don't see it, we can order it. We also have women & gender-variant (WAG) nights every second and fourth Monday of the Month from 630 - 9pm. Take care of your bike and your bike will take care of you!